Often heard complaint that tools are falling down on the ground or cannot be stored properly between the jobs gave birth to the Rekola Addon Hookit. A simple solution for any utensil with a shaft. 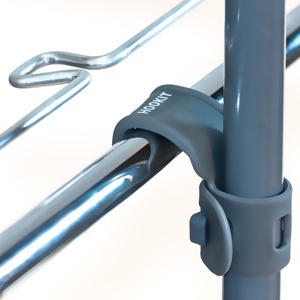 No matter if it is round, square or oval; the strap of the Hookit can be adapted to the right dimension and the metal part inside of the silicone flap can be adjusted to the surface the utensil is hang to or put at.